Food and vitamins for hair growth and hair loss. 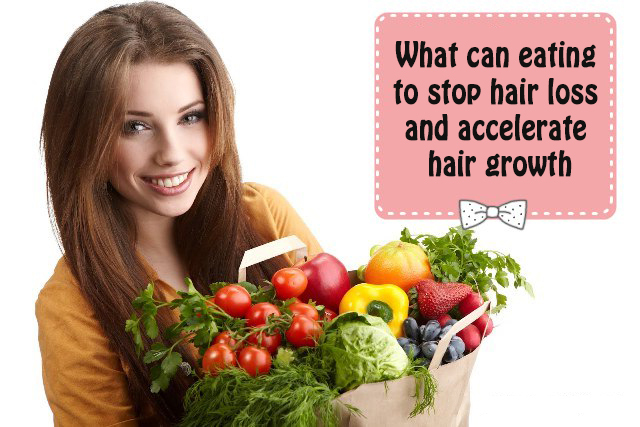 What to eat to stop hair loss and accelerate hair growth. Most likely your hair loss is a result of lack of vitamins !? Generally it can be said that the fall of hair means a deficiency of magnesium or zinc. In the fall of hair and related trophic changes may it comes to iron deficiency. The reason for falling hair can be a shortage of silicon. When greasy hair it is a deficiency of vitamin B2. Nutrition is one of the conditions for strong, healthy and beautiful hair. Reduce or off strong black tea or coffee-actuators that act on the nervous, respiratory and circulatory systems by increasing the excretion of water and important nutrients. They prevent the absorption of mineral salts necessary for the health of hair. Drink water, herbal teas and unsweetened fruit juices. Alcohol interferes with the absorption of minerals and vitamins, vital for healthy hair. Limit or completely off alcohol. Regular physical activity stimulate blood circulation, improve blood composition and facilitate the delivery of nutrients to all cells. Some contraceptives reduce the content of vitamin C and zinc in the body. If you’ve noticed that your hair changes after the adoption of these products, consult a doctor. For normal and faster hair growth in the body should proceed sufficient amount of calcium, magnesium, chromium, zinc, potassium, iodine, beta-carotene, biotin. Dairy calcium is contained in cottage cheese, hard cheeses. Source of other nutrients are fruits and vegetables – especially yellows and greens, soybeans, brewer’s yeast, nuts, legumes, brown rice, oatmeal. There are special vitamins, dietary supplement, which contain all the necessary nutrients in concentrated form. For example, vitamins for hair growth – a dietary supplement that is in the form of capsules and drink per day in a single tablet, which provides important substances which strengthen the hair, skin and nails. Furthermore Polyvitamins may be used and homeopathic medicines which act on the targeted cause of hair loss. All nutrients can be obtained from food. 1. To strengthen your hair every day for a month, Eat a teaspoon raw pumpkin and sunflower seeds two hours before bedtime. 2. Drink tea leaf nettle – 3 cups a day before meals for 1 month. This will strengthen the hair and make him shine. 3. Eating sprouted grain and sprouted soybeans strengthens bones and hair. 4. Eat apples. They have over 300 valuable biological substances. Simultaneously, rub in hair roots gruel of grated apples for a week. Wash with water only. The result will be noticeable immediately after these seven days. Hair becomes shiny. 5. Eat yogurt. Simultaneously, wash your hair with it. 6. Eat walnuts and peanuts. They contain many substances that are good for your hair. Nuts are most useful in raw form, but even more useful if they are pre-soaked for several hours in water. Then they get milk and “wake up” all the valuable vitamins contained in them.